The American Studies Department is pleased to announce the Mahmoud El-Kati Distinguished Lectureship in American Studies, held every other year. The lectureship was established by Dr. Stanley M. Berry ’75, Mr. Bertram M. Days ’74 and Ms. Ava B. Days to honor Professor El-Kati’s career as a lecturer, writer and commentator on the African American experience. 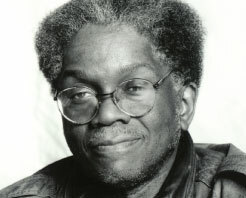 From 1970 to 2003, Professor El-Kati taught many generations of Macalester students in courses such as “The Black Experience Since World War II,” and “Sports and the African American Community.” He was also a champion for increasing the diversity of the student body and for making multiculturalism central to the College’s curriculum. He has been a frequent contributor to the opinion pages of both Twin Cities’ dailies, the local black press, Minnesota Public Radio, and a host of community-based conferences and events. As a faculty member he conveyed the importance of giving back to local communities while paying serious attention to African American history. In 2003, Professor El-Kati retired and the American Studies Department was born. The origins of the department can be traced back to 1990 when the Chair of the Board of Trustees endorsed the recommendation that the college promote a multicultural curriculum and increase the number of faculty specializing in that area. From this sprang a number of short-lived programs and concentrations until the faculty formally approved the creation of American Studies, the first new department in twenty years. In Fall 2005, the College appointed the first Dean for the Study of Race and Ethnicity to chair the American Studies department and to enlarge the institution’s commitment to scholarship and teaching in this vital field. Today the Department of American Studies at Macalester College serves as the academic focal point for the study of race and ethnicity in a national and transnational framework. The department provides an interdisciplinary approach to the study of racial categories and racialized experiences in the United States by encouraging close and systematic research and analysis, and by creating structured opportunities to apply theoretical concepts in concrete settings of civic engagement. The department is growing rapidly; just four years after its inception, there are approximately 40 majors and minors, and students across campus take our courses to fulfill graduation requirements. The Mahmoud El-Kati Distinguished Lectureship will bring new distinction and excitement to this growing program. Funds from the endowment will be used to bring a distinguished scholar to Macalester for an extended engagement that will include a public presentation, classroom appearances, and conversations with students, faculty and the local community.